Different and adorable!! Plus vanilla and black pepper sounds really intriguing. Deep prep for Christmas pudding: various kinds of raisins, sultanas, currants and peel, plus a small quantity of glace cherries and dates, are now soaking in James Squire Porter and cognac. Suggestions of an ice cream pairing? Thanks! It's a really simple cookie, but the shape makes it. It works pretty well. I found some Penja black pepper and wanted to use it for something sweet. It's aromatic and has enough bite to go with the vanilla. The classic would be a riff on brandy butter or brandy alexander... Some kind of adapted rum raisin might work. Besides, kudos for getting the puddings done in early October- it makes a big difference. I've got a couple from last year that were left over, so they should be better than ever. Dense black fruitcake style, or is there more cake batter involved? If it's a Scots-style fruitcake, the very best icecream I've ever had with one was a cognac-vanilla with chunks of candied ginger and flecks of cocoa nib in it. I think the key is to use the same licor in the icecream that you do in the ageing process. I'm also soaking fruits for puddings right now; this year I'm going straight Newfoundland traditional, with overproof rum and molasses. On making it in advance, I have just the fruit soaking at the moment. I get that people make the actual pudding in advance. How should I store it? I'm in a warm climate, so obviously it needs to in the fridge, but I was going to make individual puddings in dariole moulds. Do I just box them up and fridge them once cooked? I go the extra Canadian/Scots step of aging the puddings in alcohol; what I do is wrap them in cheesecloth and soak with 1 oz per cake (although granted I'm making 700 - 1400 g cakes, your volumes will vary). This step keeps 'em moist and also allows for that most dramatic moment - flaming the pudding at the table before coating it in hard sauce. I'm currently storing them in their cheesecloths, wrapped in tinfoil, and placed inside ziplock baggies (not vac-packed - this actually draws the moisture out of the cakes), and this works very well for me. I produce so many of these (this year's production looks to be around 50 cakes, but orders are still coming in and will until Nov. 10) that storing them in airtight supperware boxes isn't viable for me - I'd need 3 new fridges! 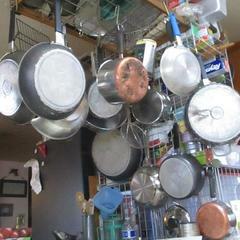 However I suspect that with smaller production volumes or smaller cakes, supperwares might be the way to go. I have aged in hermetically-sealed steel bowls before, and that worked wonderfully. I should also mention that I add another 1oz of liquor biweekly until the cakes are ready for delivery, at which point I strip the cheesecloth and do the final wrap in tinfoil. I go the extra Canadian/Scots step of aging the puddings in alcohol; what I do is wrap them in cheesecloth and soak with 1 oz per cake (although granted I'm making 700 - 1400 g cakes, your volumes will vary). This step keeps 'em moist and also allows for that most dramatic moment - flaming the pudding at the table before coating it in hard sauce. I'm currently storing them in their cheesecloths, wrapped in tinfoil, and placed inside ziplock baggies (not vac-packed - this actually draws the moisture out of the cakes), and this works very well for me. I have been making plum puddings for 40 yrs and do exactly this. I open the puddings every few weeks and add more cognac or brandy. Foil starts to deteriorate with the alcohol, so if you see that, replace it, and surely replace it at the end before giving. I leave it in cheesecloth for the final steaming. I generally leave it in the cupboard, not the fridge, but can see the point. As for ice cream, Chris: the classic pairing is hard sauce--essentially butter and 10x, very stiff--or vanilla sauce, made with water, cornstarch, liquor, and nutmeg. So for ice cream, a very rich vanilla scented with nutmeg (a kind of eggnog ice cream) would be quite traditional. I've been working on a TRES LECHES cake this past week. I love the milk-soaked dessert, but I am trying improve a recipe I found on-line; the cake loses too much height once it absorbs the milk. I will try the TRES LECHES again this week again. I've also run out of homemade strawberry-jalapeno jam so that is on my list. Finally, I'd like to make a video for homemade caramel popcorn...so we'll enjoy some of that as well. pquinene - what type of cake are you working with for the Tres Leches? You may find that a pound cake works better than the higher chiffon or angel types, since it hasn't got as far to fall when you soak it. 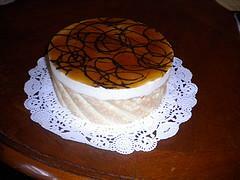 The best of the Ecuadorian versions of the Tres Leches are based on extremely heavy cakes and layers of thick cream. @Panaderia Canadiense - I am basically using a sponge cake. Your Ecuadorian version sounds luscious though. I actually have what we call a "Chamorro Cake" that is much like a pound cake. I'm going to follow your lead on that one. I'm considering a coconut milk, heavy cream and whole milk topping with a dusting of cinnamon for the soaking liquid. Thanks! Love babka. You should maybe post these on the brioche thread, too. That looks like my kinda food! 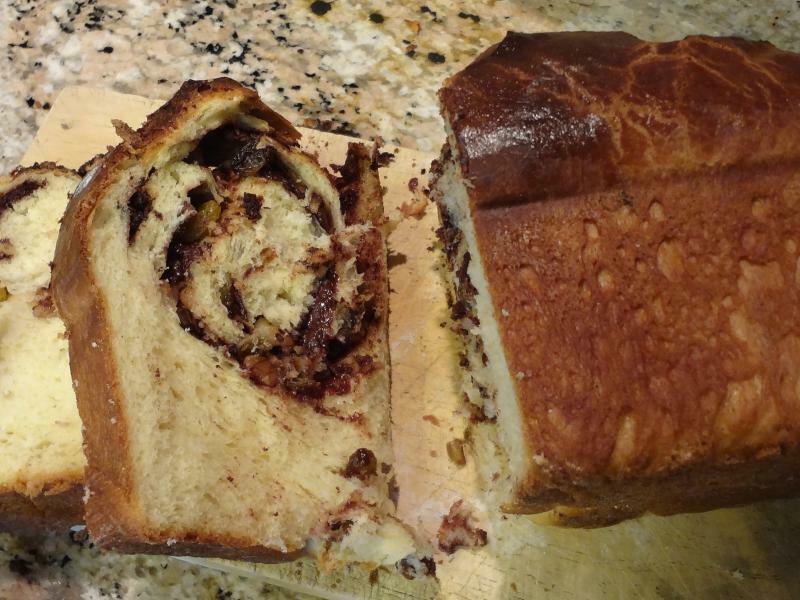 Oh, my god, that babka looks incredible. Wow, that's the best looking tiramisu I've seen! 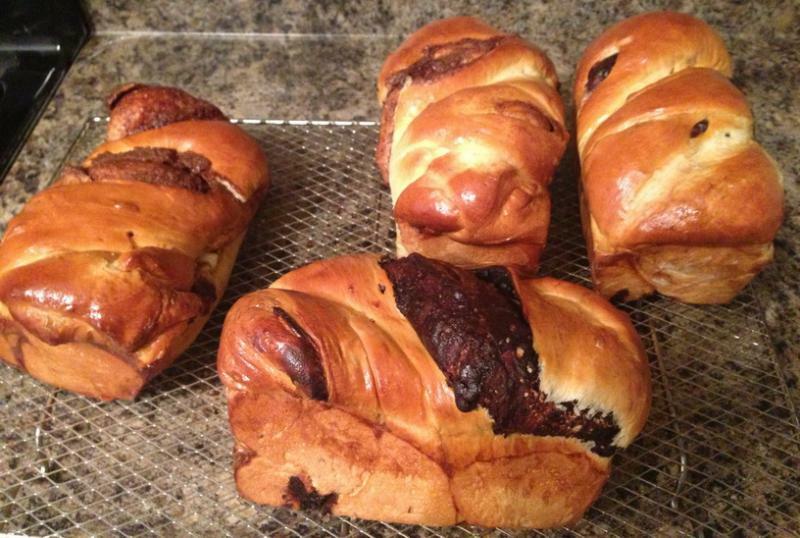 Dave, those babkas look scrumptious! How is the chocolate filling made, with choc or cocoa powder? 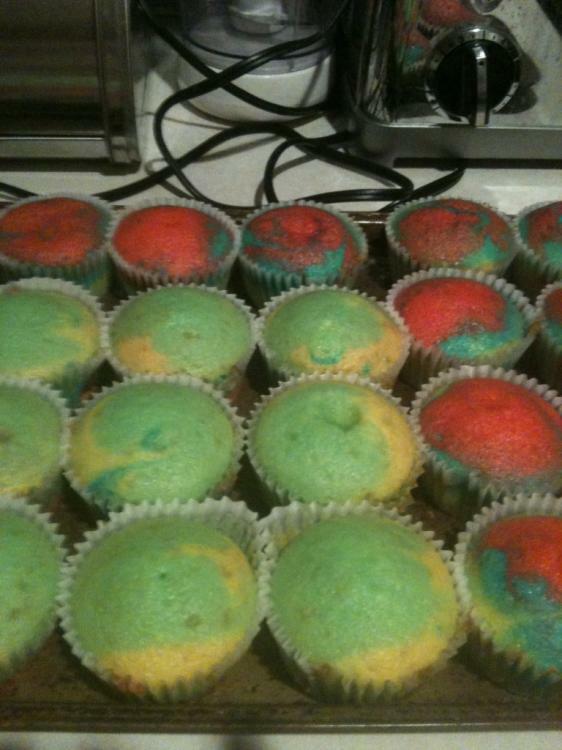 Tonight I made tie-dye cupcakes. I've posted more details in the Adventures in Brioche thread; basically the bread was laminated with the ganache; I don't recall exactly how many turns I did; looks like 6-8 though. I just kept going until the dough was so thin that the ganache was starting to break through in spots. I've got process photos if you'd like. I made strawberry-jalapeno jam this morning. It's quite delish, but the jalapenos are just not as spicy as they used to be. I'll have to throw in a habanero next time.